Please click on “Pouring Light” to see the full painting. I enjoy depicting domestic beauty, and many such scenes are to be found among the Plain People of Lancaster County, Pennsylvania. I was able to experience this firsthand in the 1980s, when I spent time among them with my family. I’ve always been interested in what has come to be known as “homesteading”. This was sparked by my parents, who lived through the Great Depression, and I’m fascinated to witness the resurgence of interest in traditional skills like preserving and weaving in my daughter’s generation. 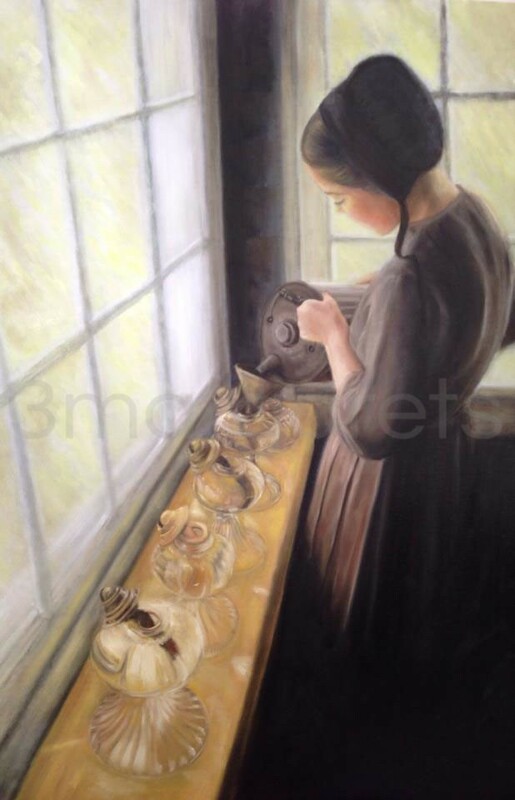 Here, a young Amish woman carefully fills kerosene lamps. Light and light-vessels (especially lamps) are loaded with meaning for Christians. Jesus said, “I am the Light of the World”, and memorably featured lamps in several of His parables. As a Christian, I believe that even daily activities have inherent dignity and worth as we work creatively with the extraordinary materials that surround us in Creation. Small domestic acts such as this one – ensuring that light will be available when darkness comes – have a transformative character beyond their humble appearance. Giclée printing on archival rag paper. Edition limited to 100 signed and numbered prints. Please click on the image above to view the full painting. I have known Margaret for more than 20 years and have always admired her gift of creativity, even more so recently in her artistic ability. She has a way of capturing a magic moment in time and placing onto canvas for all to enjoy. This particular painting called “Pouring Light” is a perfect example of that. 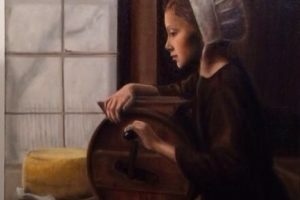 She has captured the purity and the humility of this beautiful Amish girl going about her daily chores, oblivious to the chaos of the outside world.